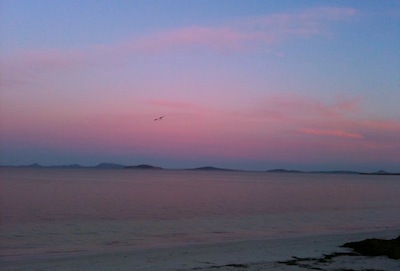 Esperance is a quiet little town in rural Western Australia. It is home mainly to farmers and employees of it’s port, kept busy exporting Western Australia’s many natural resources. It is a small town where there is rarely a queue, but also an area of outstanding natural beauty and one to make sure you visit on your Western Australia roadtrip. Before the now busy port was built, ships came to the Tanker Street jetty which extends 842m out into Esperance bay. It is nice to walk along a jetty, taking in the sea breeze and the view of town on your return, but this jetty is special as it is also a favourite haunt of characterful local Sammy the sea lion. If you fish off the jetty, you can be sure that Sammy will be watching you and he will follow you to the cleaning area in the hopes of getting tossed the scraps. As you gaze out to sea from Town beach you will see several islands. This is the Bay of Isles and a protected nature reserve. There is one island the public are permitted to visit, Woody Island. Woody Island is a favourite escape of locals. With several nature walks, beaches, a snorkel trail, a campsite and being home to sea eagles, a colony of penguins, skinks, kangaroos and many other species it is easy to see why. Town beach is a calm shallow bay, but if surf is more your scene then the Western beaches of Twilight Bay and Salmon Bay are only a 5 minute drive away (I say ‘drive’ because they are over a large hill that I have driven but haven’t yet attempted on my bicycle!) These beaches are beautiful beaches of white sand and wild waves, perfect for an afternoon rock-fishing or surfing. 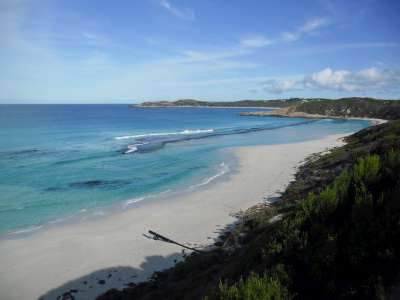 A trip out of town is very rewarding here as the local National Park, Cape Le Grand National Park is not far away (about 50 km) but home to some of Australia’s most beautiful beaches. Lucky bay is my favourite but with several to choose from, it could take you a while to decide.